Minor spoilers for the entire six season run of Justified follow. FX’s Justified ended its six season run on April 14th. With its end a particularly laid back style of TV greatness dies. Unlike Mad Men or Breaking Bad or The Sopranos—or even Game of Thrones—Justified never pretends or aspires to be the best TV show of all time, or even the best show currently on air (when it was on the air, that is). And yet, it often achieves greatness and belongs in the conversation of the best this golden age of TV has to offer. The show’s ambitions are directly rooted in its genre and its source material: the writings of Elmore Leonard. Like Leonard’s writing, Justified has no pretensions. It seeks to please and to satisfy the conventions of the crime and western genres, while delivering ample depth through its fascinating characters and deceptively simple writing. By taking the same modest approach as the writer whose work it’s based on, Justified is a constant pleasure, full of quick-witted characters, exciting action, and oh-so-much excellent dialogue. It is also one of TV’s richest explorations of escaping the past, but it’s never a show that foregrounds theme: narrative and character always come first. Justified is a television treasure, a treasure double-rich due to its artistic modesty. Justified follows Deputy US Marshal Raylan Givens (Timothy Olyphant) working back on his home turf of Harlan County, Kentucky, where his childhood friend Boyd Crowder (Walton Goggins) has become a criminal. The show begins as a case-of-the-week procedural, following Raylan as he deals with a motley assortment of criminals and fugitives working to make a buck or outrun the law, but it eventually becomes more serialized, with Raylan working against villains who last an entire season while they attempt to gain control of the underworld of East Kentucky. The constant throughout the series is the complicated relationships between Raylan, Boyd, and Boyd’s former-sister-in-law, Ava (Joelle Carter). The pilot episode starts with Boyd taking Ava hostage after she puts down his belligerent brother, Bowman, with a shotgun. The pilot ends with a twisted fried chicken dinner between Raylan, Boyd, and Ava in her home, during which Raylan shoots Boyd in the chest. Boyd survives the wound, but it changes him profoundly. Everything gets very complicated from there on out. Season two follows the attempts of the Bennett clan, led by the inimitable Mags (Margo Martindale), to take over the power vacuum left by the Crowder clan’s defeat in season one. Season three has the Detroit carpetbagger, Robert Quarles (Neal McDonough), attempt to lay his claim to Harlan County. Season four follows a mystery into a state fugitive who disappeared into Harlan’s backwoods and ended up as one of its most prominent citizens. Season five followed the dimwitted Crowe family trying to put down roots in Kentucky. And season six returned the main narrative focus to Raylan, Boyd, and Ava, with the Colorado pot-king Avery Markham (Sam Elliot) providing the season’s requisite “Big Bad.” Throughout all the seasons, and especially in the phenomenal sixth season, the tensions among Raylan, Boyd, and Ava—who each represents the varying moral shades of Harlan County— drive the series, as they’re pulled together and torn apart by their desire to prove themselves and escape Kentucky alive and well. In many ways, Justified is a western. Raylan acts as the sheriff brought into a lawless town, keen to prove himself and establish order before riding off into the sunset. It takes him six seasons to do so, but Raylan does eventually succeed in that regard, cleaning out the major criminal elements in Harlan and moving back to Miami so he can be near his daughter, Willa. But beyond the broader narrative trajectory, Justified also revels in the iconography of the western genre. It’s no accident that Raylan dresses and acts like cowboy—and is called out as one on almost every occasion. Much of this description of Raylan comes directly from the character as Elmore Leonard wrote him in Pronto, Riding the Rap, and “Fire in the Hole,” but there are some minor differences that emphasize the western elements. For instance, the show makes Raylan’s stetson larger than the character’s “businessman’s stetson” described the books; it’s more noticeably a cowboy hat. As well, the fact that Timothy Olyphant, the actor best known for playing Seth Bullock on Deadwood, plays Raylan brings the character’s western lawman characteristics front and centre. None of this is to mention how the show revels in standoffs or the western notion that justice is best dispensed by a sixshooter. It’s no accident that the first thing we learn about Raylan in the opening scene of the pilot is that he’s a quick draw. 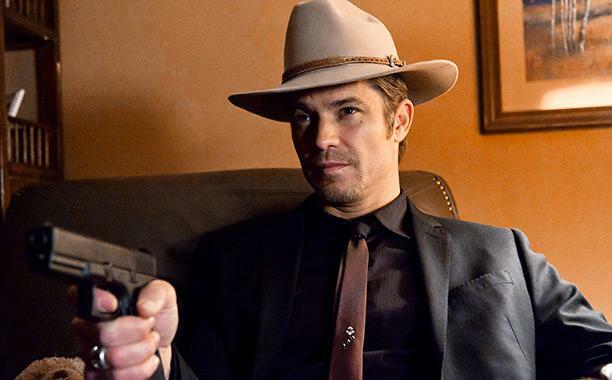 Justified may not take place in the Wild West, but Raylan treats Harlan County like it’s Deadwood or Tombstone. The show gently tweaks and plays with genre here and there like any intelligent genre work does. There’s a showdown between Raylan and a posturing young gunslinger, Boon (Jonathan Tucker), in the finale that plays just like a showdown from a John Wayne western. The two characters square off on the edge of a hill, their hands at their hips, waiting to pull. But then the scene cuts to a wide shot where both Raylan and Boon pull, shooting each other instantly and dropping to the ground. Raylan survives his fleshwound. Boon does not. There’s none of the delayed heroism of the old western shootout in this scene; just a quick, unglamorous second of violence. But it’s a gentle subversion of an iconic western element, not a deconstruction of the myth of the noble lawman and wild west justice. Justified never deconstructs the western. It’s not interested in showing the shortcomings of the genre, beyond demonstrating the moral complexity of its requisite lawman (Raylan) and outlaw (Boyd) characters. Instead, it played the genre conventions mostly straight—and it’s all the better for it. The same thing goes for how Justified plays with crime fiction conventions. It doesn’t seek to rewrite the book on how crime narratives play out or expose the harsh reality of criminal life through its stories. Instead, it uses the conventions of the genre to craft a great, satisfying story. Crime stories are full of external conflict, violence, tension, and create plenty of opportunities to introduce colourful characters as criminals are often interesting individuals. Justified revels in its colourful characters. From Bo Crowder (M.C. Gainey) to Mags and Dickie Bennett (Jeremy Davies), Robert Quarles to Nicky Augustine (Mike O’Malley), Ty Walker (Garret Dillahunt) to Avery Markham, and finally from the loveable cockroach Wynn Duffy (Jere Burns) to the king of all television idiots, Dewey Crowe (Damon Herriman), Justified boasts some of the best characters TV has to offer. Each character is unique, larger-than-life but not so big as to burst the bubble of credibility. They’re fascinating, greedy idiots living in a world that’s simpler than they deem it to be. In Elmore Leonard’s writings, criminals may have complex schemes and pull off amazing capers, but they always succumb to the limits of their own ambition and stupidity. They believe themselves to be smarter than they are. And they all die because of that arrogance. The only reason Boyd Crowder survives throughout the series, beyond his survival’s relevance to Raylan’s moral development, is that Boyd is no true criminal: he’s an outlaw. He knows who he is and where he stands in the world. He has no illusions about his talents or his moral standing. The criminal kingpins who seek to control Harlan County are always posturing. Boyd gesticulates and postulates and pontificates, in the ripest, most ornate dialogue heard on television, but he never postures. Justified never preaches its own brilliance like the many carpetbaggers who appear in Harlan County over the course of its run, ready to outsmart the yokels who live there, only to find themselves buried six feet under by sundown. If the current golden age of television has produced a climate of TV shows each aspiring to all-time greatness and overwhelming profundity, Justified is that rare television outlaw that achieves greatness through its own generic modesty. It exemplifies the notion that greatness is not born out of mere ambition, but often out of delivering a rock-solid narrative that is deep, and, most importantly, deeply satisfying. Like its most fascinating character, Boyd Crowder, Justified is a show that knows what it is and knows how to deliver what it promises. Justified may be off the air, but I hope it has a healthy afterlife, with new viewers discovering it and realizing that they missed out on experiencing, week-to-week, one of TV’s greatest pleasures. Created by Graham Yost; based on the short story “Fire in the Hole” by Elmore Leonard; starring Timothy Olyphant, Nick Searcy, Jere Burns, Joelle Carter, Jacob Pitts, Erica Tazel, Natalie Zea, and Walton Goggins.